Robots, monsters, and Ron Perlman. Oh my. Director Guillermo Del Toro has given us a movie that we’ve all wanted to see since we were five years old. In an action-packed and brilliant special effects film, we have giant 30-story robots fighting vicious mega monsters on Earth. Guillermo was the perfect person for this project as he is a fan of genre films and can tell a great story with flawless structure and good acting, while mixing in loud and vibrating action sequences. 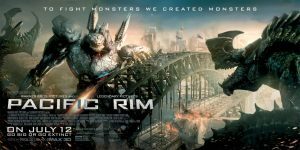 ‘Pacific Rim‘ movies fast and will keep you on your toes till the very end, and while this summer has proved that big budget action movies won’t always go the distance, I’m betting this one will. 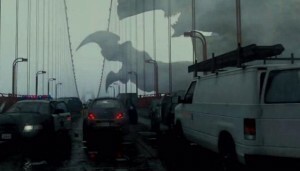 We get almost twenty minutes of a prologue before the title ‘Pacific Rim’ pops up on-screen, to which we are told that in the near future, a giant monster that resembles a mix of Godzilla and a dinosaur arises from beneath the ocean and destroys San Francisco. However, this giant beast of a monster isn’t the only one, and many more begin popping up all over the globe, wreaking havoc. These monsters are then called the Kaiju. Several years pass, and the countries of the world have set aside their differences to make Jaegers, 30-story fighting robots who are controlled by two pilots sitting inside the massive metal structures. However over-time, the Kaiju have adapted and have gotten smarter, to which they can now take out the Jaergers. Now, the Jaeger program is being flushed down the toilet by the people in charge, and being replaced by a giant wall. Now if ‘World War Z‘ taught us anything, walls, no matter how tall or reinforced they are, won’t stop zombies, let alone mega monsters. As we are still in this prologue, we meet two Jaeger pilot brother Raleigh (Charlie Hunnam) and Yancy (Diego Klattenhoff), who are battling a powerful monster near Alaska. Now the secret to operating a Jaeger is for the two pilots to synch up their brains by way of something called ‘The Drift’, which completely unlocks the other’s secrets and memories, as they can use skill set together to defeat their foes. After a tragic accident during this beginning fight scene, Raleigh quits the Jaeger program and goes to work on the wall. But when more and more Kaijus show up, the Jaeger commander Stacker Pentecost (Idris Elba) finds Raleigh again and asks him to be pilot again in one of the last four remaining Jaegers, in their last attempt to stop these monsters and save the entire planet. Since the unfortunate accident with Yancy all those years ago, Raleigh doesn’t want to share his mind in The Drift with anyone until he meets the pretty Japanese girl Mako Mori (Rinko Kikuchi), who is not only intelligent, but can hold her own in a fight with any of the guys, and the two seem to make a perfect match.Meanwhile, the Jaeger program have enlisted the help of two scientists to tackle the obstacles of the Kaiju’s origins and where and why they are coming to Earth. Dr. Newton Geizler (Charlie Day) and Dr. Hermann Gottlieb (Burn Gorman) make up these almost mad scientist duo and provide a good bit of comedy as they try to solve the Kaiju mystery. And enter Ron “man-god” Perlman as black-market Kaiju organ dealer named Hannibal Chau who might just be the greatest character invented for the big screen in the past few years. I seriously want a spin-off movie focusing on him. Guillermo Del Toro knows how to perfectly film big action sequences in such a way, that the whole audience I was with were constantly cheering, clapping, laughing, and yelling. Whether it be a Jaeger swinging an actual oil tanker ship like it was a sword at a Kaiju or one of the mega robots ripping out the tongue of a monster, all is done on an epic scale with perfect special effects and heart pumping soundtrack. The Kaiju all look very different and all seem to have a mind of their own, as these monsters might not just be on Earth to destroy. Needless to say, these special effects are some of the best I’ve ever seen. One of the biggest downfalls of ‘Pacific Rim‘ is its two main leads, Hunnam and Kikuchi. Now, while I like these two actors, they both fell completely flat with their surrounding brilliant co-stars, and their acting was almost laughable. But the film moves so fast and there is so much else going on, that you tend to forget about their bland acting. However, Idris Elba does an impressive job as always in his commanding role. His ‘Independence Day‘ style speech is amazing and his deep dark secret is something I want to explore more. Charlie Day is perfect as the big comic relief in this film as he pulls a bit from his ‘It’s Always Sunny in Philadelphia‘ character quite a bit, but much smarter. And Burn Gorman is a brilliant mix of Dr. Egon Spangler and Dr. Strangelove. Between the big action sequences, Del Toro does a great job of developing the characters, even if they are a bit clichéd and silly. But for this type of film, it works. It’s one of the most entertaining films of the year and I can’t wait to see it again. There is a sequel already in the works, so when Idris Elba yells, “Today, we are canceling the apocalypse”, take it with a grain of salt. And don’t forget to stay through the credits for a great little scene. 4K UHD Review: ‘Pacific Rim’! Plot Description Revealed for Guillermo Del Toro’s Epic Monster Film, ‘Pacific Rim’!!! Behold! Guillermo Del Toro’s ‘Pacific Rim’ Trailer is Here!!! Check Out This Viral Video of Guillermo Del Toro’s ‘Pacific Rim’!!! This entry was posted on Wednesday, July 10th, 2013 at 10:21 am	and is filed under Film, News. You can follow any responses to this entry through the RSS 2.0 feed. You can skip to the end and leave a response. Pinging is currently not allowed. « Behold!! ‘The Grand Theft Auto V’: Official Gameplay Video Is Here!! !